Trump has just proven himself to be the racist, anti-immigration person he denies being - at the expense of innocent lives. The DACA program, which protected undocumented children that were brought into America before the age of 16, has been, of course, declared to be over by the Trump administration. Congress has all but vowed to save it in a almost unusual display of bipartisanship that we don't see much of these days. As with anything that has the words “illegal” and “immigrant,” many completely support the idea of literally deporting children from the only country they know – including Trump and A.G. Jeff Sessions, because of course they do. However, contrary to what the alt-right news sources are talking about when it comes to DACA, the people who are in the program are not living off the state, nor are they just here for a free ride – they're mostly on the path of citizenship, and those who aren't haven't been here long enough to be able to. 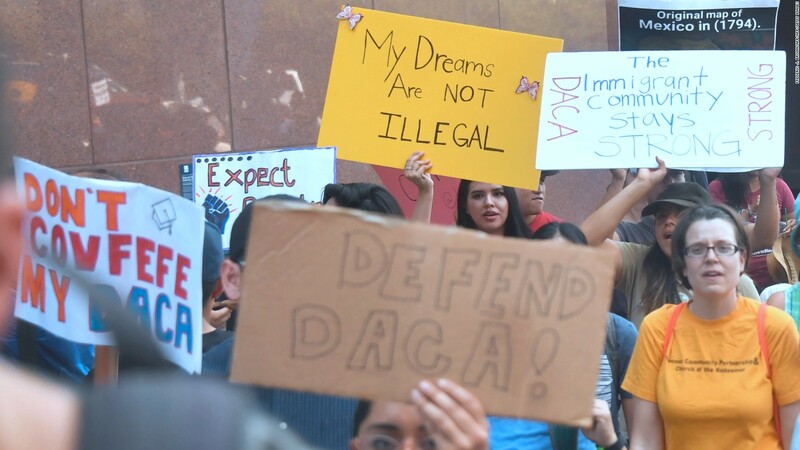 DACA, or the Dreamer program, was established by Barack Obama so that in a court of law, a child who really had no say in whether the family would enter the country illegally wouldn't be able to be arrested or deported for undocumented immigration. Strict requirements were put in place, such as an annual fee of five hundred dollars, the recipient must be working and paying taxes if of age, they must have absolutely clear criminal records – basically, they have to be upstanding model citizens. One may ask “well if they care so much to do all that to stay here, why can't they just pay the money and fill out the form to be a citizen?” In actuality, getting citizenship isn't as easy as it sounds. To qualify, one must be eighteen years of age or older, have lived here on a green card for at least five years, have not left the country for more than thirty months over the last five years, complete several interviews and tests – and that's just the main requirements, not including the fees and costs for every step. And that's where the DACA comes into play – children who immigrated here illegally are not considered 100% “illegal,” as they had no say in the ordeal. So using a program that essentially documents them as all but official green card holders, people are able to get documentation that can be used to apply for a green card, and thus citizenship. Donald Trump said not that long ago that he “love[s] the Dreamers,” then he goes and cuts the program simply because of his hatred for Obama and racism. In the announcement, Jeff Sessions went on and said that the Dreamers were “taking jobs” from real Americans and, while never actually saying he and Trump consider them enemies of the state, it was heavily implied. Consider that Trump says he is the “law and order President” and told the NYPD to be more “rough” on their patrols, it really won't surprise me if we start to see ICE bursting into schools to arrest children because their parents illegally entered America. That is unlikely, but really, don't be shocked. It is not below these people to order armed arrests of children who, as I keep repeating, had no real idea what their families were doing was illegal. Trump and Sessions cannot claim this isn't because of racism, due to the ways in which Sessions spoke about these people. And as with most of the administration's removals and cuts to programs, this was done because Obama did it and Trump hates Obama just because he is black, successful, and more liked than Trump has been or ever will be. The Trump's-a-racist card isn't as farfetched as it seems, due to several court cases in which Trump or his companies have been sued for not renting property to nonwhite people, and the “Obama birther conspiracy” that was promoted by Trump himself. Once again, we have an administration running on hatred and white nationalism, not doing their job and actually thinking like rational people. What we need is an easier pathway to citizenship. The Dreamer program should stay, but it should also include an internal system to allow these recipients to be able to get their citizenship as quickly as possible – as well as fixing the current system to allow the parents to get theirs too. The tests are designed to prove the potential citizens have the same basic knowledge as most of America does and in reality, they know a lot more. Maybe that should be a requirement to get a state ID of any form – take the citizenship test and pass. How can people come into the country and get citizenship if they don't work to have the money and life they desire? How can people be opposed to innocent, unknowing children being protected from being prosecuted? Racism is part of it, but ignorance of what it takes to be a naturalized American citizen is just as much of a problem. The removal of the Dreamer program proves the racism and white nationalist views of the White House, especially with having Jeff Sessions, who was barred from being a federal judge due to his racist views on non-whites during the 1980s, making the announcement. Meanwhile, Trump says it's up to Congress on whether the program stays, as if to make it sound like he's trying to make Congress do their job – which if that were the case, he would have come right out and said it, not send one of his yes men to call taxpayers and even veterans “criminals” because of something they had no control over. If DACA is removed, then expect to explain to your kids why their friend was hauled out of school by men with guns and why children are dying in nations they never knew because their family had to escape the horrors. You cannot, and should not, blame children for what their parents did, especially young children who were brought across the border to have a better life. This isn't a matter of illegal and legal, nor is it a political thing where “oh well a Republican said the program is wrong so it's wrong, just let the kids die, let the kids see their friends being threatened with death, and let five-year-olds be treated as criminals because they don't know they aren't a citizen of a nation founded by men who illegally took the land.” That is not America. That's the first step to another Holocaust, and honestly, with a man who refused to call out neo-Nazis using his name and supporting him in the highest office in the land, true patriots may be being arrested for hiding enemies of the state.